Discussion in 'NASCAR chat' started by StandOnIt, Nov 30, 2018. It is Ross Chastain. Per NBC Sports. He plans to do three Xfinity races with Kaulig, and the other 30 races with JD Motorsports. Wow. A month ago, who would've thought that Chastain would end up driving pretty much the same cars as 2018. Full-time Cup ride for Premium Motorsports, almost full-time Xfinity ride for JDM, three races with another Chevy team and a few Truck starts for Niece. Turtle84, FLRacingFan, Charlie Spencer and 1 other person like this. I thought the schedule was out last fall? Oh, it's the TV schedule. Interesting Fox is putting their entire portion on FS1. Probably a good move. Charlie Spencer, Team Penske and StandOnIt like this. Garrett Smithley is going to return to the #0 for JDM, Stephen Leicht is going to drive the #01. Not yet confirmed by the team, though. 2 Sweet and Johali like this. Best of luck to Jeffery. Lets see how he does on his limited schedule. Gees man, the preacher's line up is pretty scary. But all they need is Bell anyway when it comes down to it, he will carry that bunch, the rest will have checks that don't bounce. Jr has the deck stacked, should be a good one with Bell right in the middle of the fray. I wonder if ol Tyler will be any good with his new team this year, Hemric raised the bar pretty high at RCR last year. FLRacingFan, LewTheShoe and Johali like this. Yeah, most of those will be behind the wall before the first stage, and cleared out of the infield before the second. Ross Chastain is driving a better car than he usually drives. Outside underdog chance there. FLRacingFan, 2 Sweet and Johali like this. Hell, I thought this meant they were going to be on the track. read the big print Charlie. Besides I wouldn't want to listen to the yapping if they ran in the Xfinity. I tend to read from top to bottom. I'm funny that way. JBone88 and StandOnIt like this. This race is usually one of my favorites.. is it 2:30 yet?! Ventisca and StandOnIt like this. Know what ya mean, Bell is from my state, he used to race at a bull ring 25 miles away when he was coming up. So now I have two, oh my aching head. I forgot about Bell. I like him too, but it’s hard to pull for that team. 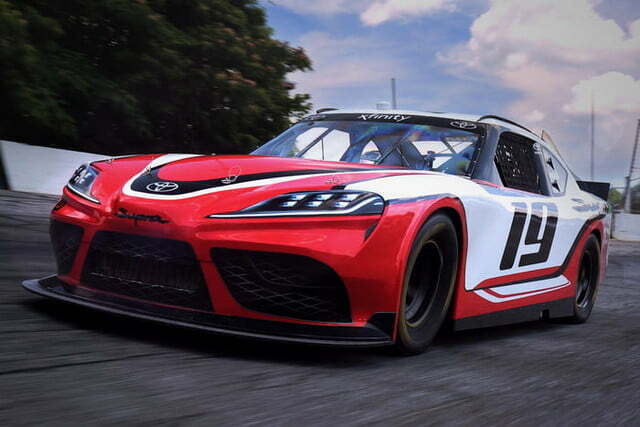 Hmmmmm, I like the snout on that 2019 Xfinity Supra. donthaveanickname, JBone88 and StandOnIt like this. Kiante and FLRacingFan like this. We had more than 40 cars attempting most of the races in 2018. Now, after NASCAR reduced the field size to 38, we have 37 cars entered at Atlanta, three of which (if not more) are S&Ps. FLRacingFan, Truex_rox and StandOnIt like this. I guess Preece can be considered a cup guy, but IMO he needs all of the experience in these cars that he can get. Interesting to see what he can do in a JR car. Go Michael Annett. I wanna see some heads explode.